Parsley is the most commonly found aromatic plant … between the teeth at the end of the meal. We will not insult you here to remind you that it is a biennial plant 15 to 50 cm high, which forms a basal tuft topped the second year of an umbel. No, useless, is not it? Here is the real subject of this article: what are the secrets of parsley? Where does he come from, and what does he like? Where does the parsley come from? Parsley, Petroselinum crispum, is found in the naturalized state in much of the northern hemisphere, but is spontaneous in Southwest Asia and North Africa . The Greeks and Romans cultivated it already in antiquity, so it is a plant that has been acclimated to our climate for a very long time, and does not pose any particular problem during its cultivation . Important features to remember when growing parsley. This form of inflorescence is named an umbel. The Apiaceae family is sometimes called “Umbelliferous”. Another specificity of parsley is the resistance of its seed , which takes at least three weeks to germinate . If you are in a hurry, soaking it in warm soapy water for 1 hour will speed up this process. To ensure regular leaf renewal, it is not recommended to cut entire stems . Better to pick the leaves one by one, preferring the more developed ones. 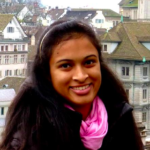 What are the differences between varieties? The varieties “curly” and “flat” were already mentioned by the ancient authors. Common parsley (flat leaves). It is considered more delicate in the mouth. On the other hand, it has two disadvantages: on the one hand, it produces seeds less easily, which makes it more expensive. Its leaves are identical to those of the small hemlock which is a violent poison. The smell and the taste make it possible to distinguish them, but caution. A close variety is ‘Grand de Naples’ parsley, which is used as parsley. In some countries it is grown like celery in the sense that the ribs are harvested. 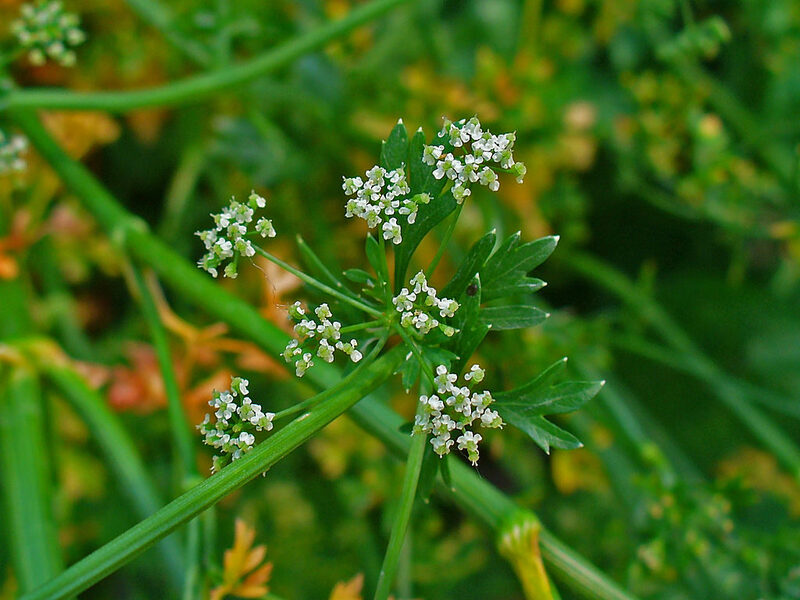 The curly parsley is less fine to taste than the common parsley, but it compensates for its decorative appearance and multiplies more easily. 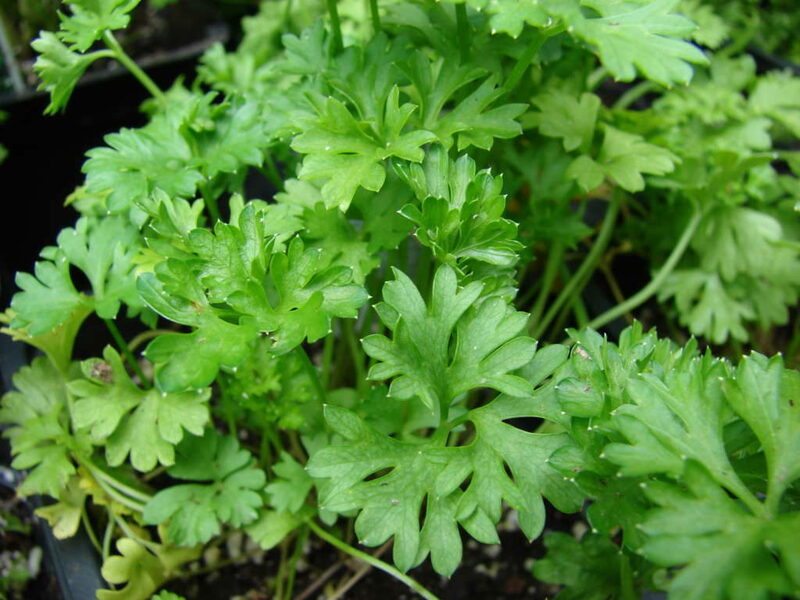 The very curly dwarf parsley has very cut and curled leaves. It is appreciated for its decorative aspect, and can be grown in pots. Note on the cultivation of parsley for its roots: hey, parsley produces edible roots! There are varieties dedicated to this use, but it is not a widespread culture in France. Despite its passage around the Mediterranean, parsley does not appreciate the drought , especially if it is in full sun. Better to provide a bright situation but sheltered from the hot sun , otherwise you may see its leaves turn yellow between two rains. A site sheltered between 12h and 16h is ideal. Once you have found the right location, it no longer requires maintenance. One of the difficulties to please your parsley is to provide enough nutrients . Ideally, it should be planted in a mixture of half compost and half soil. It also requires a deep soil with little pebbles, because its root develops like that of a carrot, and will be easily hampered by obstacles.